Meeting again at Shaika café the members headed out by the de Maisonneuve path, down the Glen to the Lachine Canal, through Verdun, across Nuns' Island, and the ice bridge to the Seaway path. Proceeding to the St Lambert locks, they found vessels engaged in the lock system. 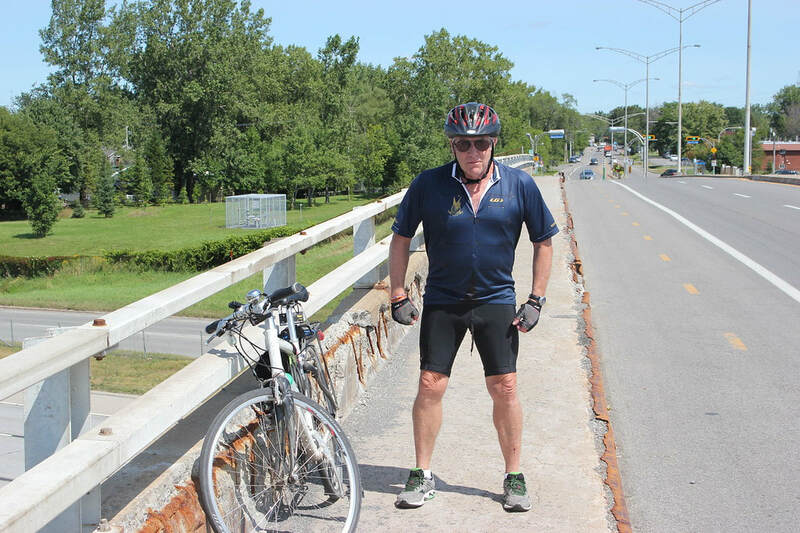 Rather than wait, they cycled to the Jacques Cartier bridge and thus gained Longueuil. They followed the twists and turns of the Route Verte through the city, quite uninteresting. Then there were a series of long stretches through semi-industrial lands, up a circular ramp leading over railroad yards, along Hydro Qubec pylon right of ways. Finally they were on a more direct route that followed an overgrown railroad bed towards Carignan and Chambly. It was mostly forested, providing welcome shade. Nearing Chambly they met Geoff and Jan riding outwards towards them. 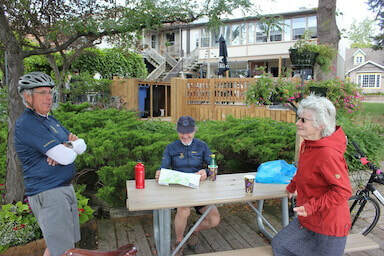 Geoff Phillips kindly invited the Montreal Bicycle Club to have lunch at his family's house whose backyard adjoins one of the locks of the Chambly Canal. A pleasant time was had on the backyard terrace. 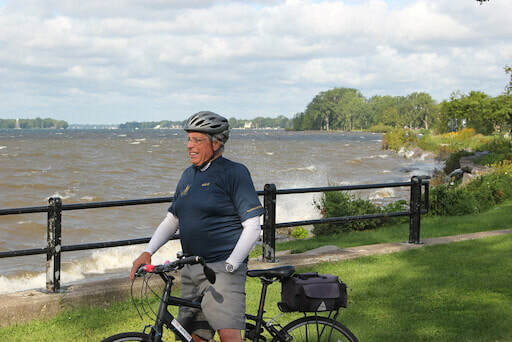 Afterwards Geoff gave the cyclists an interesting tour of Richelieu River side of Chambly, taking in the impressive curving dam, the lively rapids, the imposing fort, and the fine views across the Chambly basin towards Mounts St Bruno and St Hilaire. Geoff sketched in some of the many historical events for the area. 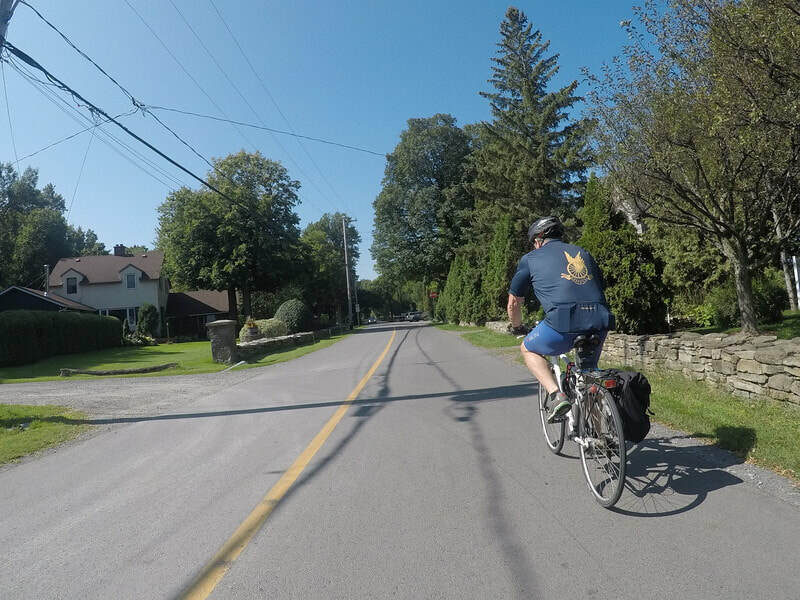 Because of the heat of the day and the late return time for the train from Mt St Hilaire, the members who had cycled out from Montreal decided not to continue with the intended cycling around Chambly but to return by the outbound route. The return was trying in terms of heat. They stopped in an air conditioned establishment at approximately the mid point of the return. The only difference from the outbound route was that the Jacques Cartier bridge was used in combination with the Concorde bridge to lead to the Lachine Canal. It was an interesting trip, especially Chambly which was exceptional. Total distance for the fixture was approximately just under 100 kilometers. The day was sunny, somewhat humid, with slight wind. There was some momentary cloud cover from time to time. The temperature reached near 30 degrees C. Geoff Phillips joined the MBC who will carry the club's colours into northern BC. Just one rider today, but I happened to meet Rob and Stephanie, both from St John NB, who were riding out to the eastern tip of the island of Montreal. Stephanie has a blog entitled " Give Her the Gears". We parted ways at parc de la Promenade Bellerive, hope they had a pleasant trip. 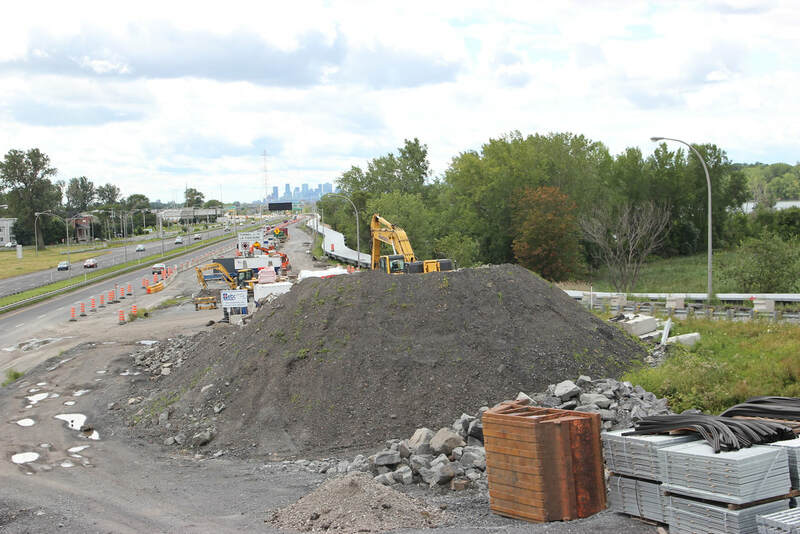 Returning from the islands along the south shore I noticed construction of new bicycle paths near the Louis-Hippolyte Lafontaine Tunnel. I hope to return later this year to view the finished result. Setting off early Sunday along the Lachine Canal the members were given a bright clear morning. They took the navette catamaran from Lachine to Chateauguay, or more exactly Ile St Bernard. It was a most pleasant crossing of lac St Louis with great views back towards Montreal. The young captain took the long way around the island so the passengers could fully appreciate its scope. After landing they spent some time at the island's point where the tower of an ancient windmill still stands. The views from the hill rise where it was built were appreciated by all. Cycling away from the island they made their way to Kanawakhe along a secondary highway with no shoulder. The drivers gave wide berth in passing. Kanawakhe was a rather sleepy town except at its church. There a congregation were gathered in a fine example of early French church construction of pleasing proportions. The members lunched a little further along in a park that bordered the cycle path as it wound its way through the town. Leaving the town proper by means of a tunnel they entered its industrial zone. They made their way along the water's edge by a compacted dirt road. Entering Ste Catherine they were on new protected cycling paths. Turning down Centrale they were led eastwards to the locks. The members cycled across the lift bridge. They turned into the riverside park that gave fine views of the Lachine Rapids and after a respite in a new pavilion they set out by bike to view the new tenting facilities. 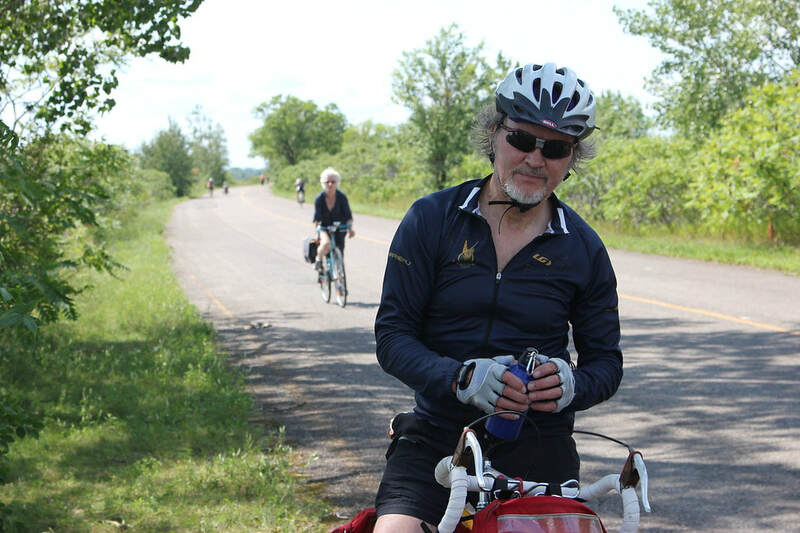 The long curving stretch of the Seaway road was not difficult with the tail wind. There were great numbers of cyclists along that stretch as well as the ice bridge leading to Nuns' Island. The members cycled the new northern section of cycle path on Nuns' Island even though they were detoured around sections that were closed because of construction. Then it was on to the Verdun bridge and the Lachine Canal with a final respite at an Atwater Market café. Finally up Atwater, along the reclusive cycling path from the Lionel Groulx to the St Henri metro stations, various streets, and up the Glen where the cycling party dispersed. It was a wonderful ride with many contrasting but interesting elements. The weather and wind were near perfect for this cycling trip. Bringing cafe and crossant along with us on the train, the members travelled from TMR to Deux Montagnes on a bright clear morning. It was there first time cycling through this section of Laval and found the trail along the Riviere des Milles Iles pleasant and at first very well marked. 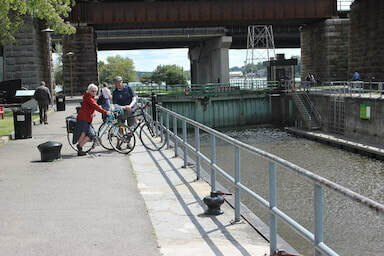 There are a number of bicycle paths alternatives and we eventually strayed from the river to further inland before connecting to the main Route Verte which we followed into Montreal over the Ile Perry bridge.Stopping for a beer at Bistro Des Moulins we noticed that one of our bicycle tires was near to breaking and cut short the return trip by taking a train from Bois de Boulogne. The club members gathered early Wednesday morning for a pre-Ride coffee and croissant...Today's adventures would take us out to the extreme west end of the Island of Montreal. The gentlemen Malcolm, Roger and William were suitably attired in the club uniform while Betty was attired in a vintage appropriate full length dress...We surveyed the destruction to Giourad Park where the original growth forest was devastated by a mighty wind....it may take 100 years for it to grow back. Our journey took us along the Maisonneuve bike path, through Ville St Pierre to the Lachine canal..at the St Pierre bridge. We headed west on the path, straight into a head wind of about 20 km/hr...which held for the day....to our delight on the return trip. The Lachine Canal path ends at the border of Dorval at which point we took a variety of residential streets rejoining Lakeshore road near Valois bay. The group stopped for a coffee at the French Pastry shop in Pointe Claire village...we took a slight side trip to observe the wind and lake at the pointe where the St Joachim church and convent with the iconic Pointe Claire windmill....( Roger commented on the similarity of the name of the church and his last name)..we observed the "yet to be mixed" flows from the Ottawa ( silty-brown) and the St Lawrence ( sediment free green). A few kilometres on we stopped at the Grove hotel (a carriage stop and resort hotel on the old Montreal-Toronto road.). The building now houses the admin offices of the Beaconsfield Yacht Club...we observed several renovated summer cottages from the early 1900's when this area was a summer resort for Montrealers. We cycled on thru Beaconsfield, the village of Beaurepaire, Baie D'Urfe until we came across the McDonald campus of Mcgill and the CEGEP of John Abbott...we admired the red brick buildings with orange tiled roofs as we meandered around the college grounds..Malcolm admired the church his family attended years ago when he lived in Baie D'Urfe. 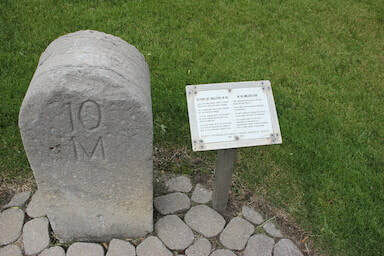 We found or way to the Lakeshore road....with clear sailing as we headed east with the strong winds at our back...we ran into to some rough sailing where the Lakeshore road was extensively torn up in the vicinity of the Royal St Lawrence Yacht club....we came across the 10 mile "stone" near Dorval Avenue.....this was a marker used to designate the 10 mile distance from Montreal on the old Montreal-Toronto road...the historic marker noted that this also designated the location of the "toll" as this was a toll road in the late 1800's requiring all who traveled to part with a few coins....be they horse drawn carriages, cyclists, or pedestrians. We breezed thru Dorval village, thence thru Lachine...(deciding not to stop for an iconic Dairy Queen ice cream)... thru the working sections of the Lachine canal..choosing to stop for a moment to admire the "very impressive" girder work being installed to replace the crumbling highway 15 structures in the area of Cote St Paul....we entered Westmount by taking Courcelles to the intersection with de Maisoneuve where we parted company with some heading east and others heading west..
Met at the ferry docks in Lachine, it is a leisurely ride to Ile Bernard where we have coffee before setting out. We passed by Beauharnois which was the childhood home of Ellie and stopped for a few photos of her old house, then had lunch in the civic park.